As a special promotion we are offering this item to you for free. Sign up here and we'll email your e-book to you. You know your body type - now what? How do you apply Ayurveda's insights to your life in order to feel great? Put your new knowledge into practice with this simple yet effective step by step plan to bring balance to your body. The 7 Day Plan to Balance Your Dosha helps you begin your new diet and experience vibrant health immediately. Feeling good will be easy for you once you have a plan. Don't know your body type yet? Find out here! 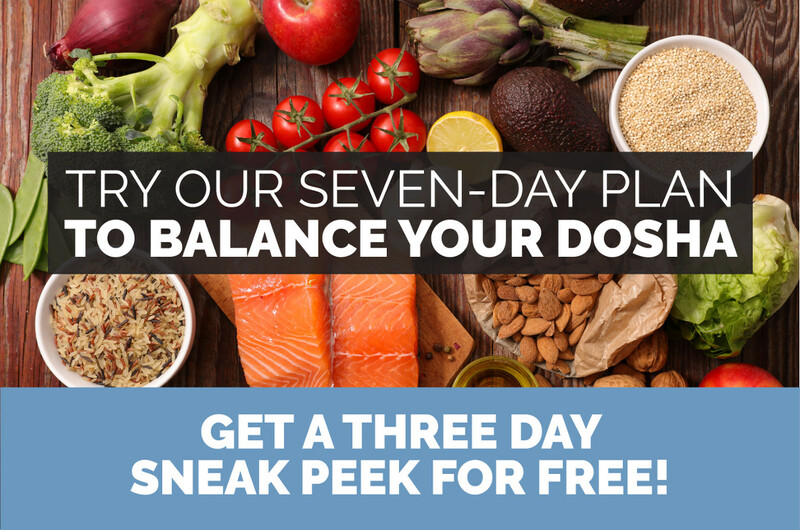 The 7 day plan removes the uncertainty about balancing your dosha using diet and lifestyle. You'll gain specific, accurate, holistic knowledge tailored for your body type. With this pdf, you'll know exactly what to eat, and what to do to improve your wellness & vitality. You'll start living an Ayurvedic lifestyle with minimal confusion. Why does a person want balance? Our bodies are supposed to be in balance. Toxins, stress, and other factors can throw your body off kilter. Ayurveda is uniquely designed to help you detect and restore balance to your system. With balance comes resiliency to illness and disease, and the ability to manage stress with greater ease. Balance gives your body a strong foundation for health. And, balance restores clarity and emotional equanimity. Altogether balance sets you up to thrive. With Ayurveda, the decisions you make in your life are based on your constitution, so they fit your body like pieces of a puzzle. Ayurveda looks at your body as a whole, giving you a tailored and integrated approach that supports your unique body type. The result is consistent, smart choices for your health and future. Based on our experience in working with thousands of clients, this regimen will teach you specific techniques, enabling you to make the best choices for your body. From removing the root causes of imbalance to introducing the best foods and practices for your unique body, this plan opens your path on the road to wellness. Attain balance and vitality through these simple yet detailed instructions with modifications for each dosha. You'll get a sneak peak at the first 3 days by downloading the pdf embedded in this article. Just by following the guidelines in the pdf, you'll gain new insights into your constitutional strengths and weaknesses. You'll discover the root causes of your imbalances and how to remedy them. Experience ease as you make sure footed decisions that gracefully move you toward well being. Once you realize the potential of fitting your diet to your body in this simple way, we know you'll want to know more. Gain access now to the entire plan along with a wealth of information about all of the body types by taking our Balance Your Diet in a Week course. By registering for the course, you will get access to 7 lectures on each dosha (21 in all! ), exercises to support your discovery and creativity in applying what you have learned, as well as our favorite recipes for your body type. Through this program you'll learn many details about your dosha, and all the self-care tips you'll need to stay balanced. Learn how to keep yourself and your loved ones healthy through simple daily practices and healthy eating. You can opt to focus only on the lectures relevant to your specific body type or gain an understanding of the big picture - how all of the doshas are affected by the food you eat and materials in the world around you. These 21 lectures will impart Joyful Belly's practical and accessible approach to Ayurveda, breaking complex ideas down into simple bite size pieces that make sense. Start feeling your best by downloading the free pdf! Shipping Notes: This item ships electronically. I love following this type of eating.